Universal Document Creator is a small windows application ($69) which allows you to “convert” your documents into Adobe PDF files or image files. It works by installing itself as a printer on your system meaning you can use the converter from any programme through the Print dialog. The name is somewhat a misnomer. The label “Universal” implies that the programme converts between different types of documents; in fact the programme only allows you to export your documents as images. The advantage is you can “export” your documents from all kinds of obscure programmes such as CAD and DTP software which is overlooked by traditional conversion software. But the conversion is very much one way and data is lost. That said – Universal Document Converter is good at doing it’s core job – exporting your documents to image files. Though the Printer Properties dialog, users are able to configure various aspects such as paper size and file quality. It’s certainly a lot easier than haphazardly print screening everything. The ability to integrate it into your existing flow through the COM-interface is certainly nice and the software can be set up so that it is installed as a network printer. At $69 for a single user license, Universal Document Converter can be a tad expensive. If you’re looking for a tool to write PDFs, my advice would be to stay clear. 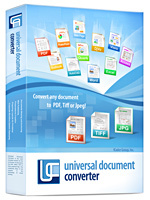 Universal Document Converter will do the job for you, but in a way which I do not find satisfactory. Universal Document Converter does do a good job of exporting your CAD/DTP/Powerpoints as image files and provides all kinds of options such as compression, quality and pallet choice. If you’ve got a lot of documents to convert to images and you’d like to automate the process, Universal Document Converter could be for you. This review is an advertising feature. fCoder provided me with a full version of Universal Document Creator for this review. This entry was posted in Reviews, Windows by Ken. Bookmark the permalink.